Train outside like they do on the ''inside'' with Roman Fritz! This chest workout will set your gains free! I created this Animal chest workout to match the simplicity of the equipment at The Yard, the old-school dumbbells and barbells at Gary Kamil's Fitness City. The workout is harder than hell, and when we shot the video the weather was hotter than hell—112 degrees in the exercise area outside the main gym in Matawan, New Jersey. 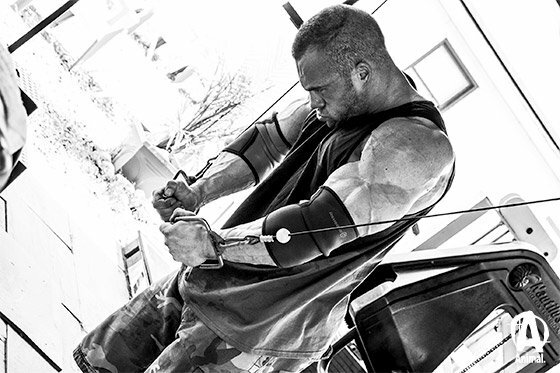 When training chest, I never focus on the weight; I envision isolating the contraction of the target muscle. 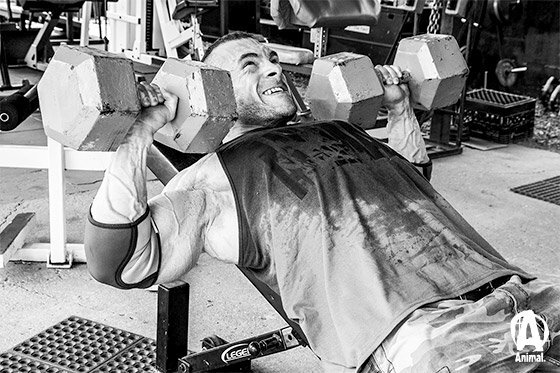 I apply this strict approach to every rep of every set of every exercise I perform during all of my training sessions. I set up my chest routines to alternate or superset between a movement that emphasizes contraction and one that focuses on stretching. The presses, both flat-bench incline, are contraction movements, so I pair them with the dumbbell pullover, a stretching movement to expand the ribcage. The dips and cable crossovers take aim at the lower pecs. Get a good stretch on the dips and a crazy contraction on the cable crossovers. Think as if you're doing a most-muscular pose, to get those striations at the bottom of the pecs. Dip it 'til you can't go no more! At the bottom, stop the movement just above your chest to eliminate all momentum involved in pushing the weight back up. Move the bar by contracting your pecs, with as little involvement of surrounding muscle groups as possible. Lie crosswise on the bench, with your head hanging over one side and your hips positioned down below bench level on the other side. With your arms extended, lower the dumbbell toward the ground behind your head, taking in a deep breath to ensure maximum expansion of the ribcage. I feel a deep stretching sensation down my whole frontal torso. 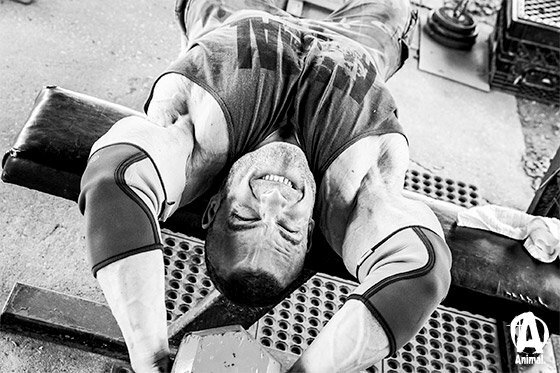 From the bottom position, bring the weight back up just above eye level to make sure the tension stays constant on the chest instead of shifting to your triceps. The same principles apply here. After a focused, intense contraction, push the dumbbells above your face. Moving the weights together in an arch-type motion toward the top allows for an even greater contraction than the flat barbell press allows. Shorten the range of motion on this move to emphasize the eccentric aspect of the exercise. Lower yourself as deep down between the parallel bars as possible, but then only allow yourself to rise three-quarters of the way up. This keeps constant tension on the pecs and allows you to focus all of your effort and intensity into the target muscle group. Bring the handles together only until they touch. This ensures that the tension remains in the chest instead of switching to the front deltoids. 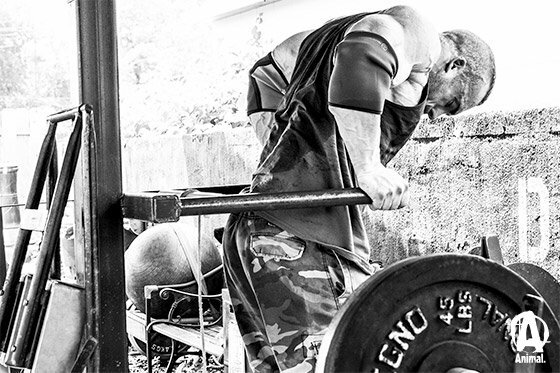 Before a given exercise, I set a goal for repetitions and sets—such as 5 sets of 12 reps or 10 sets of 10 reps. I must reach those goals no matter what it takes. I intentionally choose a weight that won't allow me to get through all the sets without hitting muscular failure. The rest/pause technique allows me to reach that rep goal. There are two different ways to incorporate the rest/pause principle: You can either rerack—totally let go of—the weight, or you can hold on to the weight in a position that only puts minimal tension on the target muscle group. This choice depends on the exercise and which is more practical. I use the second option for dumbbell pullovers in the video. As soon as I feel like I can't perform another rep, I hold the dumbbell above my chest and shift the load onto my triceps and front delts. This gives my pecs a little time to recover—no more than 10 seconds—until I can grind out another couple reps. During some very heavy sets, I might have to take several pauses until I reach the target number of reps.
Reracking the weight would not be practical with pullovers. It wouldn't make sense to let go of the dumbbells, get up from the bench, pick the weights back up, move back into position, and start all over again. Don't let the simplicity fool you! This is 30 sets of chest! Let the intensity guide you; use rest/pause, breathing, and concentration. 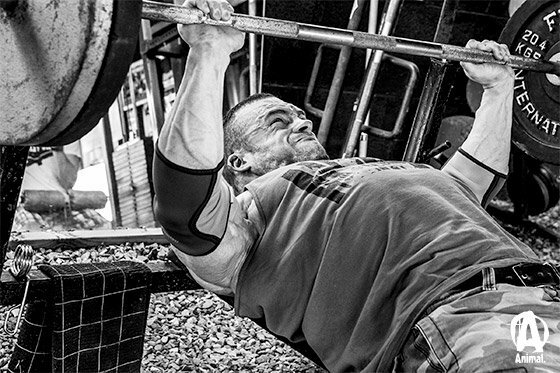 Rest 30-45 seconds between supersets.